Johann Georg Lichtenberg, the great German writer of aphorisms, wrote "Merchants have a Waste Book (Sudelbuch, Klitterbuch) into which they inscribe everything they buy and sell (from day to day, everything muddled, with no order; out of this it is transferred to the journal, where everything is more systematic, and finally it comes into a Ledger at double entrance in the Italian manner of book-keeping .. This deserves to be imitated by by scholars. First a book into which I write everything as I see it or as my first thoughts come to me, this can then be transferred to another book, where the materials are more separated and more ordered, and the ledger could then contain the connections and the explanation of the subject in a proper style." third, formulating the problem and its solution, by giving an explanation that establishes the connection between its "parts"
So, he processed the stuff that he had collected at least twice (or, if you count the first writing down, three times). We tend to forget that "digesting" the information we gather is important, more important than simoly collecting it. We need to "digest" it, as Bacon said. And our tools can help us in doing so, but they cannot do it for us. In fact, many people seem to think that they should "automate" and "streamline" their interaction with the material they want to write about. This is counter-productive. You should interact with the materials as much as you can. "Thinking is not the shortest distance between two points" (Hans Blumenberg). "A New Page: Can the Kindle really improve on the book?" by Nicholson Baker in The New Yorker. I might get an iPod Touch, after all! I have been following Ulysses for some time. It is an editor for the Mac that was an inspiration for Scrivener. It still shares some fundamental features with Scrivener. Both Ulysses and Scrivener favor something they call "non-linear writing"—a trendy new name for something that has always been part of all creative writing. I was more than just surprised when I visited the newly-designed Website of the developers recently. They now call themselves "The Soulmen," and no longer "The Blue Technology Group." I very much dislike the new theme, but you should remember I am old and use a PC. Still, this kind of Germanic "hip" or "cool" is lost on me (and I would suppose most people who would be interested in their product won't appreciate it either). Ulysses in its second incarnation is billed as "the semantic editor" and is available in two versions: Ulysses 2 and Ulysses Core. The latter promises not just semantic editing but "focused semantic text editing." It's a "stripped-down version of Ulysses 2.0; it's built on the same foundation, but more geared towards casual writers and those on tighter budgets." Why this allows "focused semantic text editing" remains a little unclear. Ulysses is called the semantic editor because it "borrows concepts from Setext and LaTeX. It truly separates content from presentation, written input from printed output. You’ll not assign font-weights and colors to emphasize words or mark introductory paragraphs; you’ll define “headlines” and “comments” and structure and meaning." I guess "stripped down" is a synonym for "focused" here. Let me be sure, I have nothing against Ulysses. It's an interesting program, and I would be glad, if something like that were available for Windows. It's just the packaging ... It may be that they are the "Leader of the Pack," and it may also be true that "since its original release in 2003, Ulysses’ interface and feature-set have quickly become the blueprint for a whole plethora of similar products on Mac OS X." But it is definitely false that "it has literally sparked a creative writing revolution on platform [sic], forever redefining the way writers will work with their texts. It all started here, and we’re *so* not finished yet." Take that, you "Scriveners!" I am "so" not "into" that! In any case, I did not want to write about Ulysses, but about Stapler, their new "Single-Document-Multi-Notes-To-Do-List." As they put it, "Stapler is a small application which blends certain aspects of classic notepads, outliners and check lists. You can think of it as a foldable notepad. Or a multi-document to-do list. - Or a foldable multi-document single-file to-do list slash next-generation notepad on steroids." Or: "Take it. Stack it. Move it. Fold it. There, you have it." In any case, it reminds me of CintaNotes and Quotepad for the PC, which seem to do pretty much everything that Stapler does, but also allow you to save the clipboard quickly. The only advantage, if it is an advantage, is that Stapler saves rtf files, while CintaNotes and QuotePlus are restricted to text files. On the other hand, Stapler costs €7.99. ConnectedText has several backup options. One of these backs up every topic in Connectedtext in a Backup Directory. This directory can be indexed and accessed outside ConnectedText itself, which is sometimes useful. I recently stumbled across Aduna AutoFocus, a semantic clustering application. "AutoFocus has the ability to scans all the places where you expect valuable information and provides powerful means for retrieving that information. The important advantage over similar tools is that AutoFocus presents the search results using facets and Cluster Maps. Facets allow to find documents on more than just keywords and the visualisation provided by the Cluster Maps allows you to see how files, web pages or emails are related." I do expect valuable information in my ConnectedText database. In fact, I do not just expect there to be valuable information. I am positive there is. And ConnectedText allows you to get at it in many ways. "The birds-eye view helps you gain insight in information that is available on combinations of keywords. In each step of your search it shows the number of documents that match your search (and of course a link to the documents themselves) so that you can effectively zoom in to find what you seek." The cluster map shows interesting connections and relations. For an explanation of how these clusters should be read, see this. Selecting a cluster results in the corresponding files being shown in the file viewer. Clicking on any of the file names opens the file in Notepad. It's licensed by an Open Software Source Licence, free for private use. "There are other causes of inactivity incident to more active faculties and more acute discernment. He to whom many objects of pursuit arise at the same time, will frequently hesitate between different desires till a rival has precluded him, or change his course as new attractions prevail, and harass himself without advancing. He who sees different ways to the same end, will, unless he watches carefully over his own conduct, lay out too much of his attention upon the comparison of probabilities and the adjustment of expedients, and pause in the choice of his road, till some accident intercepts his journey. He whose penetration extends to remote consequences, and who, whenever he applies his attention to any design, discovers new prospects of advantage and possibilities of improvement, will not easily be persuaded that his project is ripe for execution; but will superadd one contrivance to another, endeavour to unite various purposes in one operation, multiply complications, and refine niceties, till he is entangled in his own scheme, and bewildered in the perplexity of various intentions. He that resolves to unite all the beauties of situation in a new purchase must waste his life in roving to no purpose from province to province. He that hopes in the same house to obtain every convenience may draw plans and study Palladio, but will never lay a stone. He will attempt a treatise on some important subject, and amass materials, consult authors, and study all the dependent and collateral parts of learning, but never conclude himself qualified to write. He that has abilities to conceive perfection will not easily be content without it; and, since perfection cannot be reached, will lose the opportunity of doing well in the vain hope of unattainable excellence." Perfectionism and Procrastination are closely connected. Luminotes is now free. You can download the desktop version of this rather rudimentary wiki (Windows and Linux). I did, and I don't particularly like it. But I am sure some people will like it just because it is so simple, not to say primitive. Several topics can be open at the same time. The look and feel reminds me of "TiddlyWiki." The Search function is rudimentary: "You can quickly search the contents of every note in the all of your notebooks for a particular word or even several words. Just type in what you're searching for in the search box on the right side of the page, and then press enter." It also runs from your USB-Drive. Conclusion: No competition for ConnectedText! Note, Thursday, June 10, 2010: See The End of Luminotes. C. S. Lewis, claims in his The Discarded Image. An Introduction to Medieval and Renaissance Literature (Cambridge: Cambride University Press, 1964) on p. 10: "At his most characteristic, medieval man was not a dreamer nor a wanderer. He was an organizer, a codifier, a builder of systems. ... There was nothing which medieval people liked better, or did better, than sorting things out and tidying up. Of all our inventions I suspect that they would most have admired the card index." He does, of course, mean a card index of the systematic sort, the kind whose electronic equivalent is the outliner (not the Luhmannian sort that is designed to leave systematic distinctions open as much as possible). So, by extension, one might also argue that "medieval man" was an outliner. But this is clearly false, as outlines were invented only in the sixteent century. Petrus Ramus wrote 1543 in the Dialecticae partitiones: "Sett forthe shortly the some of the text, which thou hast taken in hand to interprete: next... porte thy text into a fewe heads that the auditor may the better retaine thy sayings: Thirdly ... intreate of every heade in his owne place with the ten places of invention ... and last ... make thy matter playne and manifest with familiar examples & aucthorities out of the worde of God ..."
Medieval thinkers probably would not have understood the intricacies of the card index, nor were they outliners. They were inveterate list makers. Most of these lists were flat. Many of them rather short. Some of them were even hierarchical, such as the three triads of angels, but most of them would have lacked the intricacy that is made possible by the graphical representation of outlines that can be found in Ramist texts. Having said this, I admit that the difference between lists and outlines is fluid, and that Ramus's invention was therefore not without precedent. Borges once wrote that he "always imagined that Paradise will be a kind of library." I share this sentiment. Wagn is an interesting wiki implementation. It's a "real" wiki, requiring a server, not one of the personal or desktop wiki implementations that I prefer. "In Wagn, everything is a card." And I like that, even if I don't quite see why this makes Wagn special. It's written in Ruby, which needs to be installed for it to work. It's quite a bit over-hyped: "We really hope Wagn will continue to do good in the world by making it easier for people to collaborate on, organize, and trumpet their ideas in profound and meaningful ways." To be sure, we need more people, who "trumpet their ideas in profound and meaningful ways." Or do we? I'd actually be more interested in more profound and meaningful ideas, not in more profound and meaningful trumpeting, which seems to me a contradictio in adiecto. There are two ways to install and maintain it. Either you do it yourself or you pay them a consulting fee. 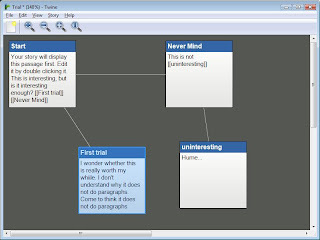 Twine is a free application for Windows and the Mac that is designed for building "interactive" stories, something that used to be called "text adventures." It can also be described as a hypertext builder. From their Website: "Twine lets you organize your story graphically with a map that you can re-arrange as you work. Links automatically appear on the map as you add them to your passages, and passages with broken links are apparent at a glance. As you write, focus on your text with a fullscreen editing mode like Dark Room. Rapidly switch between a published version of your story and the editable one as you work." On the twine website, they call this "visual thinking," which is perhaps a bit over the top. Twine uses wiki-like formatting and linking. Once you are done with the story, you can compile it in various formats, including two TiddlyWiki formats. I have no interest in writing stories—interactive or otherwise. But I do find the interface interesting for thinking about issues. Each window contains a paragraph or a thought. These paragraphs can be linked and tagged in various ways. Since you can drag them around at will, you get an interactive view of their relations much like you would in a mind map. But twine appears to be more flexible in some ways. What is mapped are not keywords, but paragraphs. While twine is designed for fiction, it can also be made to work for non-fiction—or so it seems to me. I am not sure I would use it very much, but I do think that the multi-window approach to what is essentially a personal wiki is extremely interesting. I doubt, however, that this approach will work for "grand narratives." It is probably better suited to smaller chunks of reality. It's the electronic equivalent of sorting index cards into the "proper" order, after having produced a rough draft with them. The compiled version of "stories" could probably also be used effectively in the distribution of some teaching materials. This is another version of a desktop wiki, using AutoHotKey. In this incarnation I use the freeware Word Processor Roughdraft, available at Richard Salsbury's Website, as a basis for this script. Again, the AHK script produces and executes wiki-like links to files in the same directory. 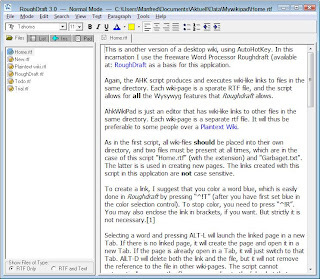 Each wiki-page is a separate RTF file, and the script allows for all the Wysywyg features that Roughdraft supports. This script creates an editor that has wiki-like links to other files in the same directory. Each wiki-page is a separate rtf file. It will thus be preferable to some people over a Plaintext Wiki. As in the first script, all wiki-files should be placed into their own directory, and two files must be present at all times, which are in the case of this script "Home.rtf" (with the extension) and "garbage.txt". The latter is is used in creating new pages. The links created with this script in this application are not case sensitive. To create a link, I suggest that you color a word blue, which is easily done in Roughdraft by pressing “^!T” (after you have first set blue in the color selection control). To stop color, you need to press “^!R”. You may also enclose the link in brackets, if you want. But strictly it is not necessary. Selecting a word and pressing ALT-L will launch the linked page in a new Tab. If there is no linked page, it will create the page and open it in a new Tab. If the page is already open in a Tab, it will just switch to that Tab. AlLT-D will delete both the link and the file, but it will not remove the reference to the file in other wiki-pages. The script cannot automatically rename the files corresponding to the links, but that should be easy to implement. You can also have a list of all the files in the Wiki Directory (to the right or left of the text, as you wish). Roughdraft usually also displays the drives, but you can force it not to do so by moving the Drive Window all the way to the top. I have also tested the script with other rich text editors, and the results are spotty. Wordpad works, Jarte (which is based on Wordpad) does not. I have chosen Roughdraft because it is fairly capable, free, and handles color better than some of the other editors I tried. I should perhaps also point out that I first adapted the script to make it work with other basic text editors, like Notepad. It works, as long as the editors don’t have fancy controls for saving and opening files. (Notetab Pro did not work—at least not easily. But it has some of this capability out of the box). The most important thing was to slow down the pasting of file names by introducing a “Sleep” and the only difference between that script and the present one is that it substitutes “txt” for “rtf”. I hope someone will find this useful (and perhaps even improve it) Again, I will probably not use it very much, as I am wedded to ConnectedText and don't find rtf capability that important. 1. The script will happily create and launch links from any word. The color (and brackets) are necessary only to identify the words with links.